Our second month of travel was spent in Nepal as we rested, ate and explored the city at a luxuriously relaxed pace. The first part of the month was spent in chaotic Kathmandu. We spent time walking around the city and seeing a couple of tourist sites. We both experienced culture shock at the Pashupatinath temple as we were crowded by weed-smoking sadhu’s and had to eat a brownie at our favourite cafe in Jhamsikhel to recover. 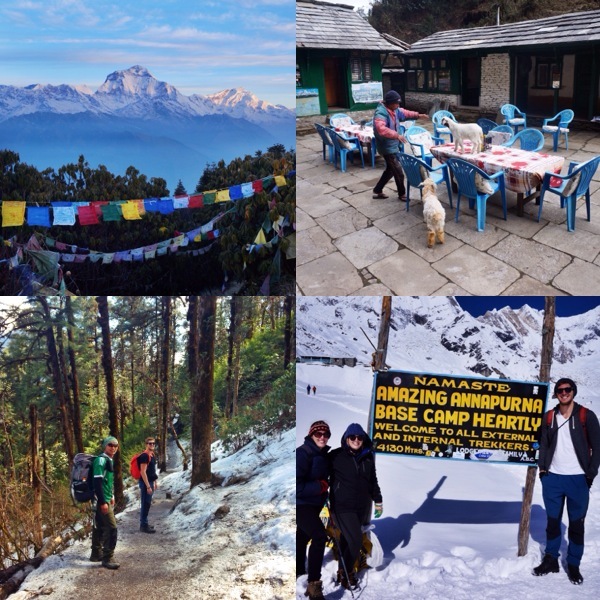 The second of the month was infinitely more exciting and found us trekking to Annapurna Base Camp. Eight days of trekking, running from avalanches (terrifying! ), slogging through deep snow and tackling my deep dislike of stairs, spat ourselves out at the top of the world and it was incredible. Articles to come! – My big sister Amy getting engaged.This is an exciting one as she is the first in the family to take the plunge and she plans to tie the knot in America. LA here we come! – Spending time at our favourite cafe in Kathmandu, Cafe Soma. Although the cafe is a little bit pricey compared to normal Nepali prices, it has a tasty menu, amazing brownies and is a quick walk from our house. – Discovering some seriously tasty food options in Kathmandu. – Getting some amazing photos and having an otherworldly experience at Pashupatinath temple. – The bus trip from Kathmandu to Pokhara on the way to trek A.B.C. I was quite sleepy but I just couldn’t stop looking out the window at Nepal flashing by. There is always something interesting to see, from a rushing glacier river to a family of baby goats grazing by the road (Baby goats are the cutest baby animals ever). Needless to say on the bus trip back to Kathmandu I slept the whole way so I am glad I managed to stay awake the first time. 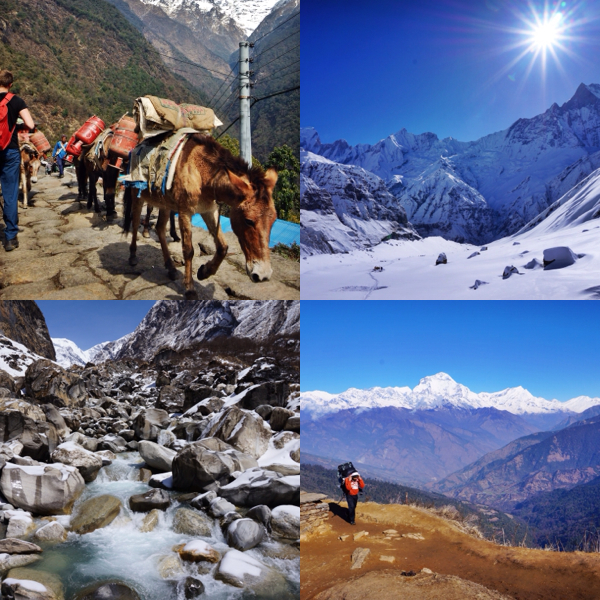 – Everyday on the Annapurna Base Camp trail. Although everyday was extremely tough there was so much amazing scenery around that drove you forward. Reaching the lodges at night to sleep was always a huge accomplishment as we walked for nine hours a day. – Frolicking in the snow. I haven’t seen snow for a good ten years so to have the crunchy, white stuff below my feet again was quite magical (Although to have it potentially crush you wasn’t quite so magical- see lowlights). – Snuggling a baby goat on the finishing day of our trek. Rounding the last corner of our trek we ran into a bit hutch filled with baby goats. The locals chuckled as I picked a rather apathetic one up and gave it a good cuddle (but seriously guys, I’m obsessed). – On the topic of baby animals, we saw a baby yak! It was so cute. – Getting a horrendous cough whilst trekking. A combination of the cold air and letting myself get run down led me to get this horrible cough which plagued me throughout the trek. I still can’t laugh without hacking up a lung. – Reaching exhaustion on the last couple of days trekking. I have never experienced true exhaustion till now. It was a huge effort to just pull the boots off at the end of the day. – Not having a plan. This is a big one for me as I need to have a future plans to get excited about. Basically we need to find a way to make some money for the next 5 months and some big plans have fallen through leaving me a little overwhelmed and bewildered. – The traffic in Kathmandu is awful. These guys sure know how to use a horn and it can get real old, real quick. – Allowing ourselves to get a bit lazy. Having a comfortable apartment, internet and a big selection of dvd’s means that we probably haven’t spent enough time exploring the city. We have two months left on our visa in Nepal so month three will also be spent exploring the country. A rafting trip down the Kaligandaki rover is hopefully coming up as well so stay tuned for that. How was your month? Let us know some lowlights and highlights of your month! I would love to know. Leave us a comment or email us at dirtypawsblog@gmail.com. No harm in staying in and watching DVD’s until you really feel like you’re up for exploring! Your photos brought back so many memories! Thank you for sharing them with us. Great post and pictures and great trip! I’ve seen an awful documentary once about world’s scariest airports, and the first on the list was the one in Kathmandu!! Thanks! I didn’t think the one in Kathmandu was scary, there is one in Lukla which is in the everest region and the end of the runway literally just drops off a cliff. The plane has to rely on some updrafts to stay in flight. Um terrifying,..
Wow. This is a dream trip for me – look forward to more photos and the write up! It was incredible 🙂 Got about four more posts coming so keep an eye out!